Turkey Meatloaf10 Best Fillers for MeatloafMeatloaf CupcakesMeatloaf! Our Newest Series is Out! We’re kicking meatloaf up a notch and stuffing it with a surprise. Just wait until you slice into this cheese stuffed Italian Meatloaf. If you’re lucky you’ll have leftovers. 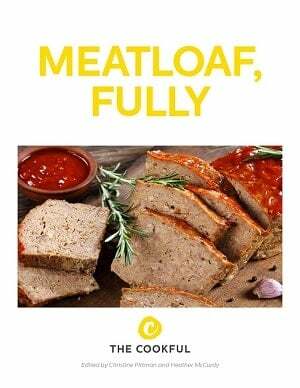 Want to know the easiest and most delicious way to upgrade meatloaf? Stuff it with cheese, of course! This meatloaf smells so good while it’s baking away in the oven, that it’s almost impossible to let it rest the full 10-15 minutes. 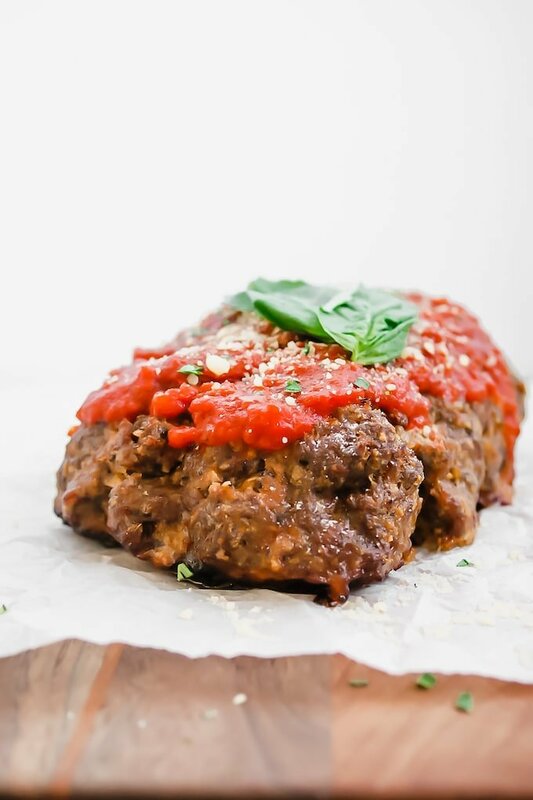 This Italian-inspired meatloaf is reminiscent of meatballs in the best possible way. To really kick up the Italian flavor, we use a combination of ground beef with ground Italian sausage. If you’d like to skip the Italian sausage, you can sub ground beef, just add an additional teaspoon of Italian seasoning. Instead of our favorite ketchup and mustard glaze, this one’s topped with marinara sauce and finished with some fresh basil for a pop of color and fresh flavor. 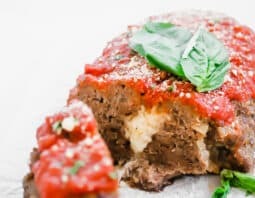 If you need a gluten-free option, we suggest following the basic directions for swapping the breadcrumbs and other gluten-containing ingredients for ingredients found in this Gluten-Free Meatloaf. Preheat oven to 350°F. Heat the oil in a medium skillet over medium heat. Add the onion and saute until softened, about 5 minutes. Transfer onions to a large bowl. Add in Italian sausage, ground beef, breadcrumbs, Italian seasoning, garlic powder, salt, pepper and egg. 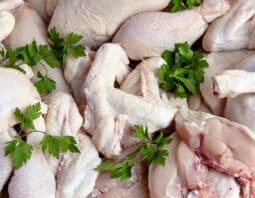 Use your hands to evenly mix the spices into the meat, being careful not to overmix. 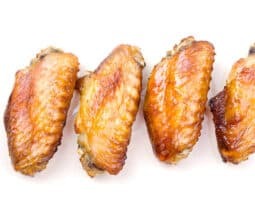 Line a large baking sheet with foil. 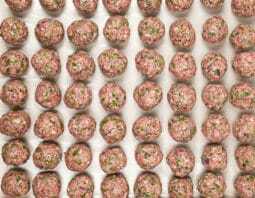 Transfer meat to baking sheet and shape into a 10×5 inch loaf. Create a well in the center of the loaf with your hands. 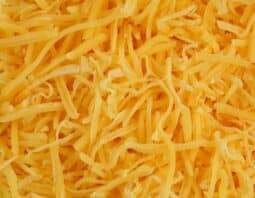 Sprinkle cheese into the well and form meat back to form a “seal.” The cheese should all be stuffed into the meatloaf. Bake for 45 minutes. 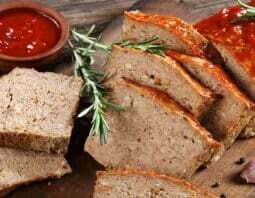 Remove meatloaf from oven and spread with marinara sauce. Return meatloaf to oven and bake until internal temperature on an instant read thermometer is 160°F, about 10-20 more minutes. Remove meatloaf from oven and let rest for 10-15 minutes. Top with fresh basil and Parmesan cheese if desired.